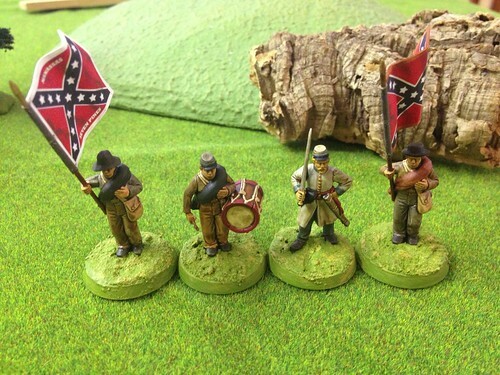 After some time I have finished my first batch of Perry Miniatures plastic American Civil War figures. I enjoyed making and painting these. I feel they got the balance between kit form and ready to go correct for when you want a lot of figures quickly. 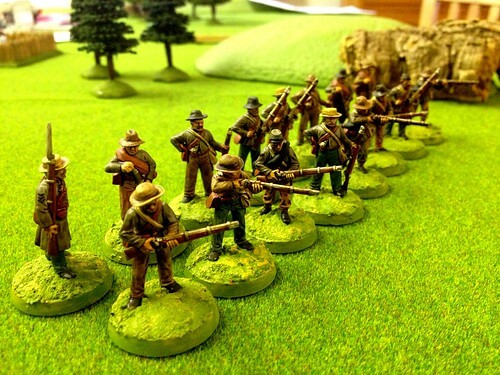 I finished the figures with my own version of the Army Painter’s dip. I have used Ronseal wood stain for years and brush it on for greater control. I only use it on figures where I have used mainly warm colours as the brown effect doesn’t work well on cooler colours like blues and greens. So Confederates in browns and warm greys are an ideal subject! 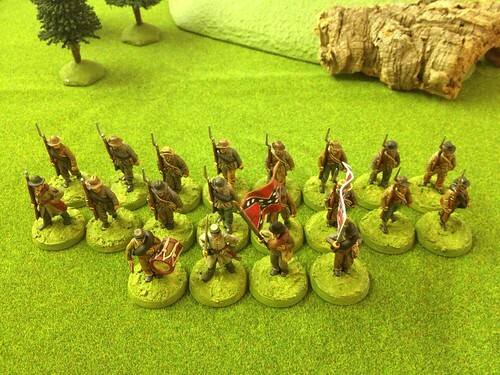 I used the flags supplied with the figures. They are quite rigid even after applying pva glue but that made them hold their shape well when put on the figures and bent to shape. A quick brush around the edges tidied up any white paper showing and job done. It’s now a choice between some more Union figures or continuing with the plastic confederates. A pleasant choice to have! I expect I will return to this later in the Autumn.